Unless you look carefully, you might not know that there’s a 62,500 sq. ft. manufacturing facility under construction right in the middle of Northfield. I’ll see if I can get one of the owners to give us an update. In the meantime, when’s the last time something of this size (private, not public) occurred in Northfield? Previous PostThe new trees on 7th St by the swimming pool seem to be suffering. Who’s responsible?Next PostShould Fiber Optic Network be Public Infrastructure? Griff: Where is this going up, and who’s building it? Do I get to guess, or am I disqualified? Tracy: Oh, now I get it. That info. was left out on purpose. I’m bouncing back and forth between too many tabs this morning. I think it’s the building going up behind Cannon Valley Vet Clinic on Highway 3. ..part of a JOBZ project by the Strobel-Werner Partnership which house veterinary pharmaceutical manufacturing and several other animal health related businesses. 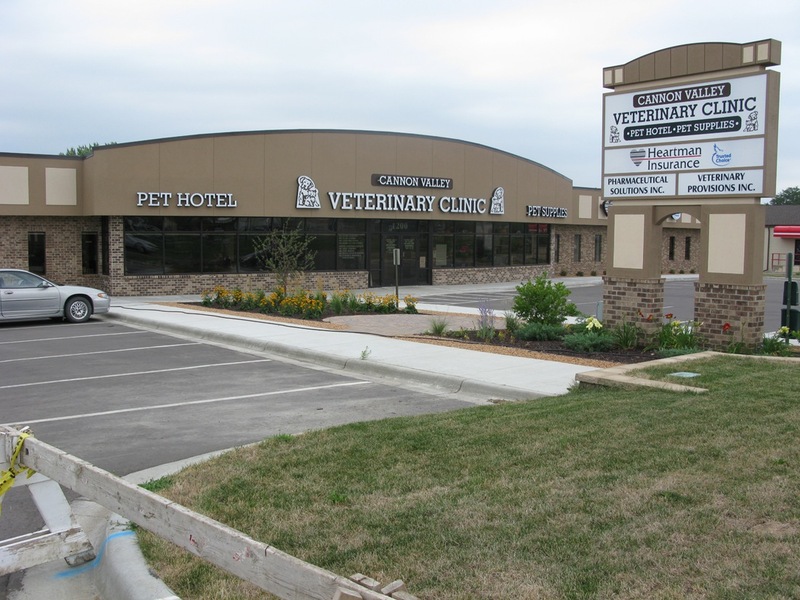 This is the Cannon Valley Vet Clinic, is spending over $7 million dollars to expand their facility, and get into the animal pharmaceuticals market. If you have not been there recently, they have completely remodeled the store and clinic, and continue to expand to the rear of the building. It really is very, very nice. Thx for that link, John… I’ve contacted the Nfld News, as I think that story was much longer than that. I’ve added a photo above. 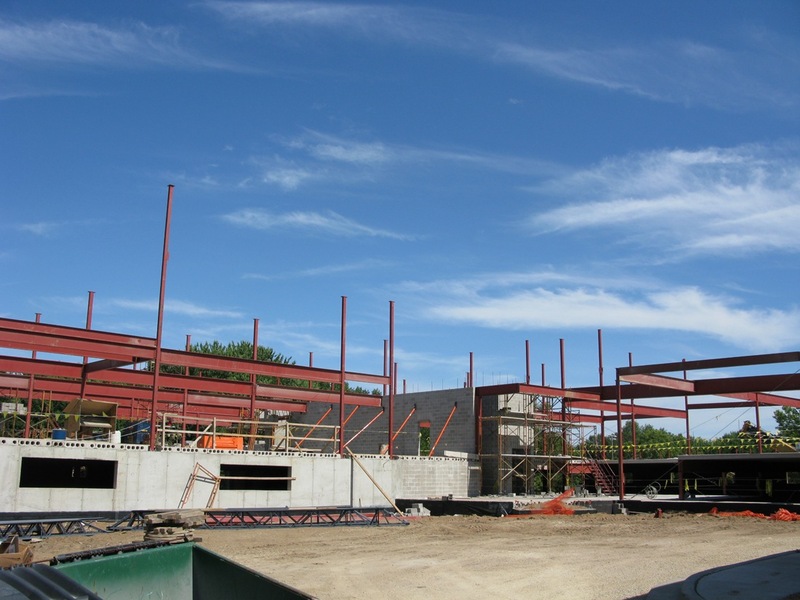 I blogged about the developments at the Cannon Valley Vet Clinic (and the Strobel-Werner Partnership companies) back in Nov. 2007. Yes, the article was a full page, front page article, with multiple pictures. OK, I have tried to post a comment during work hours for many days, so finally I wised up and decided to reply from home, so Griff, Tracy, et al, it’s not that I don’t love you…. What you see in Griff’s pics gives an indication of what we (Mark Werner and Mike Strobel) are doing. Notice the Cannon Valley Veterinary sign and you will notice two small signs, one says “Veterinary Provisions”, the other one says “Veterinary Solutions”. Vet Provisions is a company whose idea is that the sales of Veterinary drugs should be in the hand of the Veterinarian and not the lay distributer. Today the majority of pharmaceuticals sold in livestock industry do not have Veterinary supervision. We are trying to get the veterinarians back into the decision of what pharmaceutical to use and when to use them. This will be the best way to insure safety in the food supply. Veterinary Provisions is the distribution center for the products we handle. It has grown nicely in the past several years, thanks to dedicated help and loyal customers who believe in this idea. Vet Solutions is a company that is in the process of developing pharmaceuticals for the animal industry. The building (that was once hidden but now has grown to a size where its hard to hide) will have a warehouse in the lowest floor for product distribution, sales on the second and product development on the third. It will also have a FDA approved facility for approved antibiotic production for the livestock industry. There will be dust collection and a water treatment plant within the facillity for safety of the enviroment. Only filtered air and treated water will be released. As far as jobs go, first a plug, Jobz kept us in town and the city was great to work with. The administrative staff did its best to keep this project going and as timely as possible. Northfield has a lot a regulations, most useful and for a great purpose, that is to keep the town prosperous and well maintained. We did an unusual thing in placing a commercial building on city land, and it took time to go through the hoops. The city was helpful. Mary and I started Cannon Valley Vet Clinic in 1981, I did the veterinary work, she did the paperwork. Today we have about 40 on the payroll, from entry level jobs, kennel helpers, data entry, sales, pet store personal, warehouse workers, janitorial staff, accountant, bookkeepers, engineer, chemist, managers, quality assurance personal for the FDA plant, vet techs, vet tech assistants, receptionists, and 6 of the best veterinarians anywhere. All are dedicated, and do a fantastic job in their area. We are set up to continue to create skilled jobs in this town for the future. My pets have always been in good hands there. The veterinarians are so kind. I hope a couple deluxe suites are going in for the animal hotel. Think about it, you could call it the Pet Penthouses. I forgot to mention that we are adding on to our kennel, and yes we are making several deluxe suites. Mark, thank you for taking the time to provide us with some of these details. It’s helpful to hear directly from the source. When you came before the Planning Commission with this project, I was impressed by all the thought you’d put into the expansion plans, and by your willingness to modify anything you thought would reduce the potential environmental impact of the expansion. I wish we had a dozen more business owners like you in Northfield. David, I’m interested in why you think this public relations firm is a good fit for Northfield? Anne – I came across DCI while reviewing a bunch of PR firms from a list. I don’t really know much about DCI except their web site raised issues that seem appropriate to Northfield. Personally, I think Northfield has a lot of strong cultural, physical and spiritual features but needs a stronger unifying vision to stay unique in the future. This type of PR firm seems to specialize in building that vision and helping to present it to the outside world. Thanks, David. If you notice their client list, they specialize in cities and regions much larger than Northfield, aiming for national exposure. There are many firms here and in the cities that can do the same work. But a PR firm won’t do any more good for Northfield than it would for Britney or George Bush. In fact, Northfield gets more than its share of positive press. The problem here is that a vision can’t be given to you by someone from the outside. IMHO there are some people with some deep issues of disrespect and ego who are standing in the way of real progress. Until people with different views can treat each other better and make it their mission to find a COMMON set of goals, they will continue to go round and round in the pointless power struggles that block progress now. The attitude that anyone who disagrees with me is wrong and must be defeated drives poisons public discussion, drives most people away from the process and makes people who have choices in where to locate their businesses stay as far away as possible. Anne – DCI seems to very specifically handle “place.” But Britneyfield would probably have businesses taking numbers.